The Asian Human Rights Commission (AHRC) has learned that three girls in Burma have been sentenced to a year in jail with hard labour for allegedly selling illegal lottery tickets. When the case against them came to court, the judge reportedly ignored evidence given that the three girls are not yet 16 years old, and should have been tried in a juvenile court. All six of the defendants claimed that they were innocent of the charges and that the police set them up; the AHRC has also received information that the police bribed the prosecutor to take the case. In the mid-morning of 27 February 2009, a group of police from Daik-U station in Pegu, north of Rangoon, went to the house of Daw Aye Myint in Ushitkone village. She was in the fields at the time, and was called back to the house to find the police with her daughter, Ma Amy Htun, 15; her sister, Ma Sein Htwe, two other adult women and three other girls. The police accused them of running an illegal lottery ring–which are very common in Burma–and arrested them all. The accused denied the charges but were held at the local lock up and were denied bail. According to family members, each time they took food for the girls and women they had to pay the guards 500 Kyat (about 50 US cents) to give it. One of the girls was found to be underage and was transferred to the juvenile justice system, but the others were recorded as ‘youths’, which under the current law in Burma means that they are 16 or 17 years old and can be tried as adults. The police allegedly falsified records to make the girls birth dates earlier than they are. The girls submitted evidence to the court, like testimonials from school headmistresses, to support the claim that they are children. The prosecutor and judge had special responsibilities to check the ages, which they failed to do. The police allegedly also paid the prosecutor to proceed with the case knowing that the ages of the girls had been falsely recorded. As the government of Burma places special emphasis on the rights of women and children–the UN Convention on the Rights of the Child and the Convention on the Elimination of Discrimination against Women are the only two rights charters that it has joined–it should be possible to have this case opened and the girls released. The Child Law grants special authority to the social welfare minister to order immediate and unconditional release of children held in custody. So please sign and send the sample letter below. The AHRC has been documenting numerous cases that address what it has described as Burma’s ‘injustice system’ which can be accessed by going to the appeals homepage and typing ‘Burma’ or ‘Myanmar’ into the search box: http://www.ahrchk.net/ua/. Two special reports have also been issued in the article 2 periodical, Saffron Revolution imprisoned, law denied (vol. 7, no. 3, September 2008) and Burma, political psychosis and legal dementia (vol. 6, no. 5-6, December 2007). 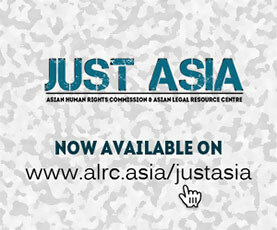 There are also a number of related sites, including the AHRC Burmese-language blog, Pyithu Hittaing and the 2008 AHRC Human Rights Report chapter on Burma. Please write to those listed below to call for the immediate release of the six convicted persons, especially the three girls. Please note that for the purposes of the letter Burma is referred to by its official name, Myanmar, and Pegu as Bago. Please be informed that the AHRC is writing a separate letter to the UN Special Rapporteurs on Myanmar and the independence of judges and lawyers, the UN Working Group on Arbitrary Detention, the UNICEF office in Burma and the regional human rights office for Southeast Asia calling for interventions into this case. 1. Daw Aye Myint, 46; resident of Ushitkone Village, Daik-U Township, Bago Division, Myanmar. 2. Ma Sein Htwe, 41; sister of first defendant; resident of Ushitkone Village. 3. Ma Ei Ei Khaing, 29; resident of Ushitkone Village. 4. Ma Sanda Win, aged under 16; resident of Ushitkone Village; currently held at Bago Prison. 5. 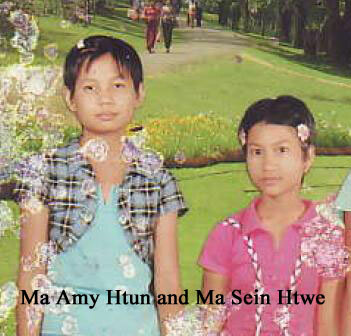 Ma Amy Htun (a.k.a. April Htun), 15 (DOB: 30 December 1993); daughter of Daw Aye Myint; resident of Targwa Village, Daik-U Township; currently held at Bago Prison. 6. Ma Thuza Khaing, 15 (DOB: 4 December 1993); resident of Targwa Village; currently held at Insein Prison, Women’s Block, Building 2. 1. Deputy Inspector Tin Maung Aye (prosecuting officer). 2. Deputy Inspector Aung Win (investigating officer). 3. Police Corporal Zaw Naing Soe. 4. Police Corporal Aung Naing Latt. (All officers from Daik-U Township Police). I am shocked to hear that a court in Myanmar has sentenced three children to a year’s imprisonment with hard labour, and I urge that this case be immediately reopened and that the correct ages of the girls be ascertained so that they are released without delay. According to the police, at around 11:30am on 27 February 2009 Deputy Inspector Tin Maung led a team on the instructions of the Daik-U Township Police commander to Ushitkone Village where they entered the house of Daw Aye Myint on a warrant and in the front room found the second to sixth accused with books of illegal lottery ticket stubs, record books and 45,950 Kyat (about USD 45). Aye Myint was out at the time. After she came back they were all arrested and charged will illegal gambling. They were held in the police lock up without bail until the case came to court. While there, the families allegedly had to pay the police sentries 500 Kyat each time they came to bring food for the detainees. In court the accused denied the charges and said that the items of evidence were not theirs. They said that they had signed the search warrants out of fear of the police. They also said that they had never seen the two men who the police brought as supposed witnesses for the search and seizure at the house. They did not have lawyers to defend them. Whereas the court recorded the ages of the fourth, fifth and sixth accused as 17, 17 and 16 respectively, the judge was informed that they were all aged less than 16 but he apparently failed to verify this fact because the police gave allegedly falsified documentary evidence on their ages. I am aware that the law in Myanmar stipulates that anybody not yet aged 16 must be tried as a child under the terms of the Child Law 1993, which was introduced in partial compliance with the international Convention on the Rights of the Child. This means that the three children in this case should have been held and tried separately from adults, and should have been sentenced according to a completely separate regime in which imprisonment would not have arisen as an option in sentencing. Nonetheless, the judge tried the three as youths (aged 16 or 17). As there was doubt raised over the ages of the girls on the basis of information that was brought to the court which contradicted the records of the police, the judge should have taken steps to obtain further evidence to show the ages of the defendants one way or the other, but apparently he failed to do so. Yet the Child Law places special obligations on a judge to correctly ascertain the ages of persons who are apparently youths brought before him and even though the police and prosecutor also have to give correct evidence of the age of the accused (sections 67, 68). I have furthermore been informed that the law officer who handled the prosecution case, one Daw Myint Myint Soe of the Daik-U Township Law Office, allegedly received 30,000 Kyat from Deputy Inspector Tin Maung Aye to try the case against the three girls as adults. Interestingly, in giving the verdict the judge also instructed that of the amount of money seized, this figure of 30,000 Kyat be returned to the investigating police rather than submitted to the state treasury. In light of the above concerns, I urge that this case be immediately reopened and reviewed so that the correct ages of the girls can be established and so that, in the event that they are found to be underage, they can be immediately released in accordance with the authority granted to the Minister of the Social Welfare Department under section 59 of the Child Law. Furthermore, in light of the serious doubts about the credibility of the case, I urge that the three adult detainees also be released pending a full re-examination of the facts, which should be conducted through a special inquiry team appointed from outside the township. The team should also examine the allegations of corruption and the alleged violations by the local police of sections 37 and 38 of the Child Law, by sending up underage girls to a township court rather than a juvenile one. Finally, I take this opportunity to remind the Government of Myanmar of the need to allow the International Committee of the Red Cross access to places of detention, in accordance with its globally recognized mandate, without any further delay.